Welcome to Day 2! For today’s food challenge we’re going to help tame that sweet tooth. When you get a sugar craving that just won’t quit think “fruit first”. To satisfy your sweet tooth without pushing yourself over the calorie edge, resist that chocolate cake and instead enjoy a sliced apple with a tablespoon of nut butter (like peanut or almond) or some plain Greek yogurt with a few berries mixed in. This will keep you on the right, healthy track. For your fitness challenge I’d like you to do 30 minutes of your favorite cardiovascular exercise, but work in a few intervals. Interval training is a great way to burn more calories and beat boredom. How does this work? By doing short bursts of high intensity exercise throughout your workout. For example, if you’re running do several 30 second sprints during your routine. So you might run at your regular pace for 3 minutes and then do a 30 second all out sprint. Do 5 or 6 sprints and you’ll really get more out of your run! 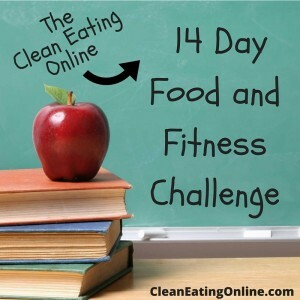 Click here to start the Food and Fitness 14 Day Challenge!